Above: The Argentina Canyon. Photograph by Laurence Parent. This moderate 6.3-mile hike loops through lush, high-altitude forest (climbing from 7,380 to 9,100 feet) and along rushing streams in the White Mountain Wilderness of the Lincoln National Forest (575-257-4095, fs.usda.gov/lincoln). THE TRAILHEAD: Drive 10 miles south of Capitán on NM 48 and turn right (west) onto NM 37, or drive about 12 miles north of Ruidoso on NM 48 and turn left (west) onto NM 37. Follow NM 37 about 1.3 miles to FR 107, on the left. Take it about 9 miles to the end of the road, passing Bonito Lake. The road turns to gravel after the South Fork Campground turnoff. Follow the signs on the north side of the parking lot to Trail 39. 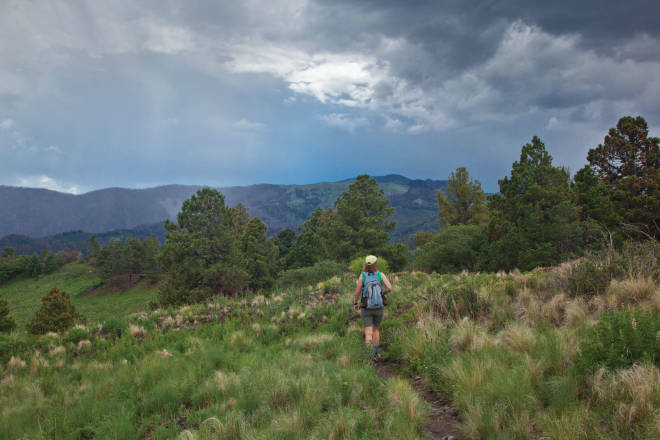 WHAT YOU’LL SEE: The White Mountain Wilderness and adjacent Sierra Blanca Peak are the highest mountains in southern New Mexico and bear alpine tundra and glaciation scars from the most recent ice ages. Quite a few springs occur along the crest of the range. You’ll pass enormous Douglas firs, aspen groves, an old cabin, and tremendous views that reach all the way to the Tularosa Valley and the Oscura Mountains. Trail 39 climbs for 2.5 miles to Crest Trail 25, across a grassy meadow. Turn left (south) on the Crest Trail and follow it for 1.3 miles to a well-marked five-way junction. Take Trail 37, which angles sharply left (northeast) then descends steeply along Little Bonito Creek for about 1.3 miles to the junction with Bonito Creek. Turn left on Trail 36. An easy 1.3-mile walk along a rushing stream past two old mines brings you back to the trailhead.